Dattu Phadkar was one of the main player of the India cricket team in 1940s and 50s. A very good all-rounder who can bat and bowl as well, Phadkar had two century in his career and some very good bowling performances. He was one of the most handsome player in the team. Dattu Phadkar was a former Indian cricketer and known for his all-round cricketing ability. He was a right hand middle order batsman as well as a utility right-arm medium pace bowler. Phadkar has represented India in 31 Tests and was one of the most handsome player in the team. He was born on 12 December, 1925 at Kolhapur city and died on 17 March, 1985 at Chennai. Dattu Phadkar started playing first-class cricket in 1942. His international debut came during India's tour of Australia in 1947-48. He performed well in his debut test by scoring 51 in India's first inning. He also took three wickets for just 14 runs in Australia's first inning in that match. In the fourth test at Adelaide, he made a brilliant century scoring 123 runs in the first innings which was also his highest Test score. Next year against West Indies, he came up with his best bowling performance of 7/159. Phadkar scored his second century against England in 1951/52 when he score 115 runs. 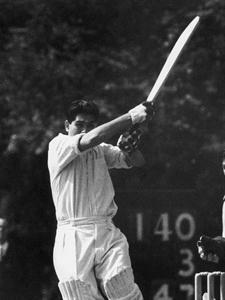 In domestic cricket, Phadkar played for Bombay (Mumbai), Bengal and Maharashtra. He has also captained the Bombay team in 1950/51. He has a very good first-class record in bowling, averaging just 22.09 in comparison to his Test bowling average of 36.85.